A vanity unit not only supports your sink and hides pipework, but also provides plenty of space for cleaning products, toiletries and bathroom accessories. So, whether you're designing a bathroom from scratch, looking to maximise storage in an en suite or small bathroom or are simply looking for bathroom design inspiration, our gallery of great vanity units will help you find something you love. Our ultimate guide to planning, designing and furnishing your bathroom provides both advice and inspiration for making your dream bathroom a reality. Our guide to how to design a bathroom is a handy read, too. If your bathroom has a contemporary look, consider opting for a simple vanity unit that speaks for itself. Opting for a finish that (almost) blends in with the rest of your scheme will help create a sleek and stylish finish. Combining chrome and a white high gloss finish, this vanity from Duravit's Cape Cod Collection provides abundant storage space, concealed behind sleek doors. Find more design ideas for a contemporary bathroom in our guide. Paired with a distressed mirror and moody grey scheme, a dark vanity unit is in keeping with the dark and atmospheric interiors trend and makes a stylish addition to an industrial-inspired bathroom. In addition to functioning as a design feature, this Metal and Mango Vanity from Tikamoon, via Wayfair, provides ample storage for bathroom essentials, complete with two large cupboards and a series of drawers. Tempted by a dark interior in your bathroom? browse our black bathroom design ideas for more inspiration and advice for pulling off the look. Don't let a small bathroom put you off having a stylish vanity station. Simply opt for a slimline solution and pair with a large bathroom mirror and striking wall lights to create a feature. This is particularly effective for brightening a small space and making it feel larger. Find this Hemnes/Tornviken Vanity Unit at Ikea. For busy couples or families, a double sink can make mornings much less manic. When choosing a vanity for a family bathroom, consider something that's large enough for two counter basins and provides plenty of space for storing bathroom essentials. This unfitted Layang Teak Washstand from Tikamoon, via Wayfair, has a relaxed, almost boho feel, proving that style doesn't have to be compromised for a vanity that's practical. Looking for more bathroom storage ideas? We have plenty over in our guide. Styled with a delicate houseplant and freshly folded towels, this art-deco inspired, marble top vanity unit works just as effectively in a bathroom with contemporary patterned wall and floor tiles, as it would as part of a more traditional, pared-back scheme. A chrome storage shelf makes a handy addition for a practical bathroom, though open storage is only recommended for natural tidy beings. Find the Double Thames Vanity Basin Suite at Drummonds. Another option, if you're looking to add interest to your bathroom, is to opt for a statement vanity that speaks for itself. The asymmetrical design of this Kompass Vanity Unit from Frontline Bathrooms would work well as part of a home with a Mid-century feel, thanks to its dark wood peg legs and geometric inspired design. If you're designing a bathroom from scratch, consider inserting a recessed shelf above the spot you have in mind for your vanity. This will prevent the space from becoming cluttered and offers a valuable bathroom storage solution. Match the material of your vanity counter with that of your recessed shelf for a smart and cohesive finish. This vanity unit was a bespoke design by The Wood Works. If you're looking to prioritise storage, while maintaining a light and spacious bathroom with a stylish, Scandi feel, consider opting for a vanity in a light finish that matches the rest of your scheme. We love the pairing of these Hemnes/Rattviken Vanities with a small storage bench and towel hooks. Recreate the look with Ikea buys. If you're planning a pink or on-trend pastel toned bathroom, consider opting for a vanity unit with a natural finish to complement your use of colour and give the space a more sophisticated feel. We love this pairing of a wood finish vanity with dusky pink sinks and copper faucets for a contemporary and feminine feeling space. Find similar at Wayfair. Not sure what colour scheme to choose for your bathroom? Our bathroom paint ideas provide on-trend inspiration. Opt for a vanity with a bespoke feel if you want to design a space that's unique, contemporary and interesting. If you can't find an authentic piece at a reclamation yard or furniture fair, a textured wood vanity will achieve a similar effect. We love this Rosewood and Lava Stone Vanity paired with a patterned, neutral toned rug and a stylish mirror composition. 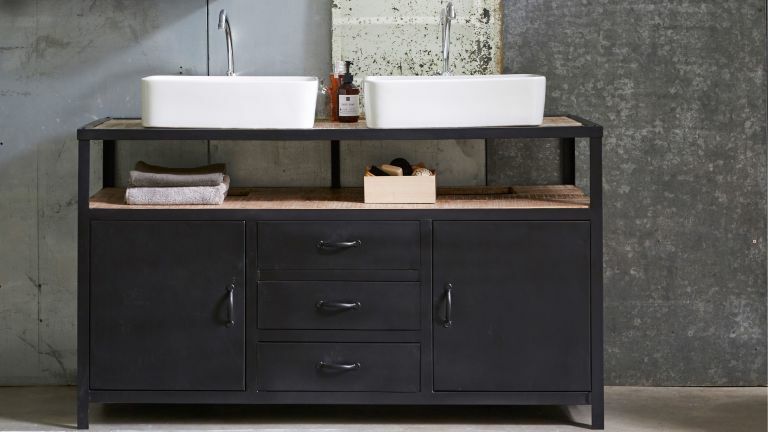 If you're designing a bathroom with a sophisticated feel or are looking for a storage solution that won't go out of style, it might be worth considering a vanity with a sleek black finish. Pair with a matching black mirror as part of an all white scheme, incorporating colour with elegant houseplants and other accessories. Find this Victoria & Albert Mandello Gloss Black Vanity at Sanctuary Bathrooms. Looking for more bathroom design inspiration?